Cast your spell you spooky creature! Your magic is powerful and attracts mesmerized followers to the party. Channel your inner demon, or dance under the full moon in the Sheer Spiderweb Cape. Maybe your Halloween costume is a vampire queen looking to catch victims in her web. This accessory allows your costume creativity to run wild. Create something new! 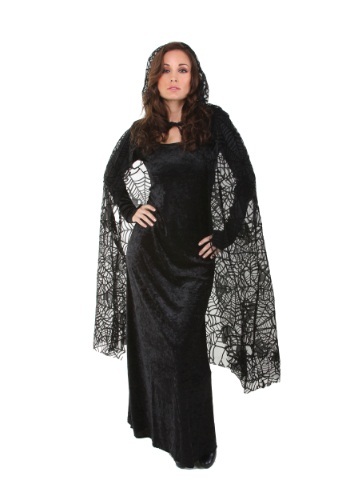 The 100 percent polyester flocked knit mesh cape is stunning to accessorize any costume. Having the cape end at the calf creates a more Gothic look. This sheer cape ties at the neck and can be worn over most costumes. Create an extra level of mystery by adding the Sheer Spiderweb Cape to your ensemble. Pair this cape with the Spider Web Arm warmers for added webs.